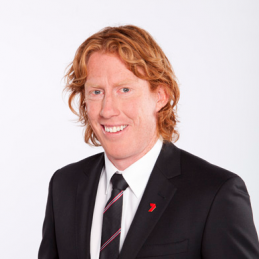 Cameron Ling was an incredible leader who inspired and excited team mates and fans alike. An incredibly durable and consistent player who battled for 11 years with Geelong. Known for his tackling, pressure and love of a fierce contest, he was made club captain in 2010 and became a premiership captain the following year, kicking the final goal in the match. Following the club’s third premiership in five years he announced his retirement as a best and fairest winner, All-Australian and triple premiership player. Ling was quickly jumped on by Channel Seven, giving expert comments and boundary riding. Ling’s contribution to the broadcast displays incredibly current football nous and intelligence. This year he also joined 3AW’s radio team as a specialist football commentator. Ling has also taken a role as Director of Football at the prestigious Geelong Grammar School. A crowd favourite, Ling is affectionately referred to as the mayor of Geelong. With mass appeal across the football public, his wit, charm and personality will add to any function or event.